May 18th is Haitian Flag Day! It's a day to celebrate and eat - something all Americans can appreciate, right? 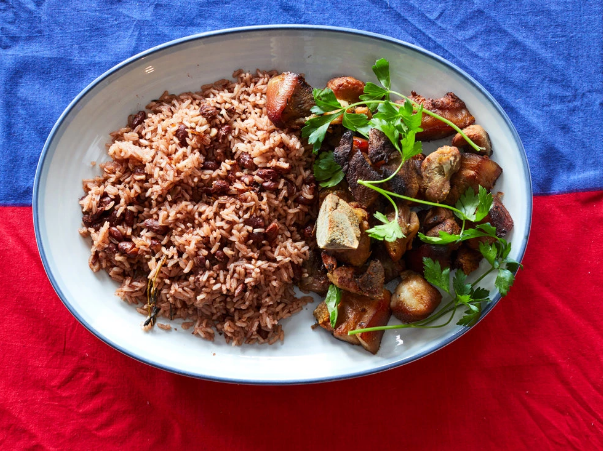 In a recent article, The New York Times, introduced a Haitian family transplanted on Staten Island that spends hours each year making a medley of native Haitian dishes. "A day once marked by compulsory demonstrations of national pride under the dictator François Duvalier, it is now observed as the highlight of an entire month of heritage celebrations for the Haitian diaspora." What is Haitian Flag Day? "Flag Day has been a major holiday in Haiti since 1803, when the revolutionary leader Jean-Jacques Dessalines tore up a French tricolor and had his goddaughter, Catherine Flon, stitch together the country’s first independent flag. The new banner consisted of just a red and a blue stripe, without the central white stripe of the tricolor. It is said to symbolize the unity of the nation’s people of color, and rejection of its white colonizers. It was not until Jan. 1, 1804, that Haiti officially declared independence from France, becoming the first free state in the Caribbean liberated and governed by its former slaves. That revolutionary spirit is still a source of national pride and celebration." What native Haitian dishes are usually prepared for Flag Day? At just about every Haitian gathering you will be served griot which consist of pork should spiced with Scotch bonnet chiles. The pork is marinated and cooked to a tender perfection and then fried to create a delicious crust on every sided of this cubed goodness! To learn more about what dishes are served alongside griot or to learn about Flag day, click here.